This is a sponsored post written by me on behalf of Citrus Lane. If you are like me you have a few (or a lot) of gifts left to check off your list. Don’t worry! I’m still sharing lots of great ideas over the next week or two! Here is a unique idea that can last all year long. Maybe you’ll want to get this one yourself! Have you heard of Citrus Lane? It is a company that sends boxes monthly full of fun and unique products geared toward children ages 0-5. These may include toys, snacks, books, and/or personal care products. I was excited to receive my own box to test out and share with my children. Here’s what my box looked like. I really liked the packaging so I took lots of pictures. There was even a punch out activity on the bottom of the box. And these are the contents. I am a music teacher to kids, so the rhythm sticks immediately made their way to my rhythm box where they will get lots of use. My kids were really excited by this light-up octopus and decided it should be a present for our new baby when it comes. It can glow in green or blue light and scatters stars across the ceiling. We arm wrestled over these organic baked Potato chips and I won. No, I shared, but what can I say, if the pregnant woman wants to eat something, you’d probably better let her. I need to find some more of these! My 1st grader loved reading the stories in the Ladybug magazine. They were interesting to her and she could read them to her younger brother. There was also a coupon for a FREE digital subscription to the magazine, or info on how to subscribe to the printed version. We enjoyed discovering each of our fun surprises. It would be really fun to have a surprise each month, and not just on Christmas! Something to look forward to throughout the year. Especially since my birthday is in December, too. If you are less enthusiastic about surprises and want to pick what you are getting, you’ll want to check out the newly launched Citrus Lane Shop. It is full of beautiful, high-quality toys and children’s product. I was impressed with the educational value of the toys they carry, and they all appeal to my design aesthetic! Here is some merry news, just in time for Christmas!! One of you will be getting a $25.00 voucher to the Citrus Lane Shop! Leave a comment stating what you would purchase from the Citrus Lane shop if you won this voucher. BONUS entry: Tweet about this giveaway using the hashtag, #CitrusLane, and leave the URL to the tweet in the comments. Hurry! Giveaway ends Dec. 15! This is a sponsored post written by me on behalf of Citrus Lane. New customers who purchase a subscription will receive $10.00 off their first month with code BLOGPOST. Expires 12/31/2013. 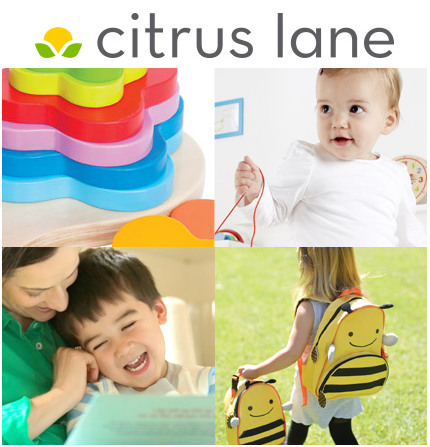 Offer Terms: Discount may only be applied to subscriptions purchased by new Citrus Lane customers. It cannot be applied to gift subscriptions. Subscriptions automatically renew to full retail price, $25 per month. You may cancel anytime. For more information, visit http://www.citruslane.com. The oatmeal colored Teddy Bear would be perfect for the grandbaby due in February! Thanks so much for the opportunity! I would love to order a box geared toward a newborn. I love the decorative blocks. I would order the Octopus light. My girl would LOVE that thing! She’s been begging for a similar light for a while now. I think my preschooler would love the ukelele. I love the octopus light super cute.